When you deal with people’s lives on a daily basis, you can’t let language become a barrier between your patients and better healthcare. This is why medical clinics, hospitals, and health insurers come to Dynamic Language for quick, accurate translation and interpretation services that help build better care, lower costs, increase patient satisfaction and, above all, improve quality of life. Because communication is at the heart of quality healthcare, Dynamic clients know they can rely on our ISO-certified language services to help them achieve the same standards we set for ourselves. Doctors and health professionals can’t do their job properly unless they know exactly what a patient is going through, while healthcare can be a scary thing for patients unless they understand what is happening around them. This is where our interpretation services pay dividends with non-English speaking patients – allowing doctors to diagnose more effectively and advise patients without any misunderstanding, while our healthcare translation services equip practitioners with the documents they need for patients in any language. Need language services to offer the same quality of care to everyone? Find out more about how our language services mean everyone can get the healthcare they deserve – including vision and hearing impaired patients. 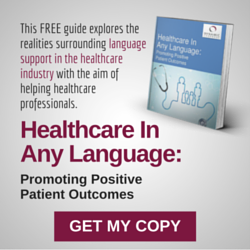 Or visit our blog page to learn more about the importance of language services in healthcare. Dynamic has a very courteous and helpful team. Dynamic e-mail notifications and follow up calls are greatly appreciated. The Interpreters Dynamic send to sites are very courteous and respectful. Interpreters that Dynamic language provides are very professional and skilled. Always great customer service! Thank you for your many years of excellence. Dynamic Language is always courteous and professional when I call to request an interpreter. They try to fill that request as quickly as they possibly can and always notify me if they are unable to fill it. Many times, our requests are “last minute” and Dynamic Language comes thru providing an interpreter for the majority of those requests. Excellent service and I’m glad to be able to utilize your agency for interpreter requests as needed. I have had many positive experiences on the phone with Dynamic Language and in person with the interpreters that come into the office over the years in several different departments throughout Group Health. You are the masters of the interpreter universe and I thank you! Well done everyone! I look forward to many more years working with you all. All of the interpreters we deal with in the clinic from Dynamic are wonderful and very friendly. Very professional. I have found Dynamic Language to be professional on the phone answering right away and getting me to the appropriate department quickly. I enjoy the ability to schedule and confirm via email. Dynamic Language provides a great service! It’s a pleasure working with you on behalf of our patients! Dynamic Language was very easy to work with, provided excellent customer service and project management, met or beat every deadline and the pricing is very fair. I will definitely be using them again. Every interaction with Dynamic has been positive and supportive. Dynamic is exactly that! Our patients feel comfortable and receive excellent service and valuable medical information. All my encounters with Dynamic and their interpreters have been respectful, professional and helpful and much appreciated for it is important that all of our patients get quality care and service. Dynamic Language ranks the patient’s needs and wishes as their first priority! They make navigating health care doable and less frightening for patients who do not speak English as a first language. I am always greeted with quick and efficient customer service whenever I have to contact Dynamic. The speed in which they reply to requests is phenomenal. I never hesitate to use Dynamic Language for my customer’s translation needs. In fact, I insist on it. Several times interpreters have spent one-on-one time with some of our clients who have difficulty understanding our process. We truly appreciate their efforts. We also had a last-minute request for an interpreter just 2 hours before a meeting. Dynamic Language was able to find an interpreter who showed up on time and did an outstanding job. Dynamic Language works very well with Group Health; for a long time I didn’t know that it was a different entity. I thought it was part of the company. Great job! I’ve worked with your interpreters at community clinics and in-hospital, with patients spread across the full spectrum of socio-economic status. Your interpreters have been very professional in their behavior and eager to help, yet never interfering, which is critical in health care. You and your team are doing excellent work. Thorough proofing, quickly bringing up potential issues and questions for resolution, clear and effective communication with the decision makers which ultimately saves time and gets final proofs to the editor sooner rather than later. Nice work! The [interpreting scheduler] is always a pleasure to speak with. She is extremely friendly, professional and patient whenever I speak with her. Dynamic Language has helped us by translating technical drawings and work instructions from French to English. The staff at Dynamic Language has met all quality requirements and time driven goals to our high standards. I have found Dynamic to be responsive, professional and expedient when requesting translated documents. I enjoy working with them and look forward to our continued relationship. Dynamic Language has been amazing to work with; their response to needs and turnaround times are what helps our Program function in a consistent and compliant manner. We are thankful for all they do. We appreciate having a specific person who manages all of our jobs, who can easily retrieve earlier jobs that just need updating, and who understands our particular preferences in formatting dual language and other types of documents that we have developed. Your customer representatives are wonderful! They always respond in a timely manner and quickly resolve any issues. Also, the layout and graphic design of our projects is excellent! Very rarely do I need to go back in and “tweak” any layouts. I love working with Dynamic!